Half a kilometre from the city of Gerakini, Ikos Olivia, with its own private beach, is one of the most popular hotels in Halkidiki, Greece. Spread over a whopping 22 acres, this modern hotel welcomes its guests to 291 luxurious accommodations fitted with private balconies, private pools, groomed gardens and terraces. When it comes to gastronomy, the hotel’s restaurants serve French, Greek, Italian and Asian cuisines curated by Michelin-starred chefs. Four swimming pools, including a lagoon pool with swim-up bar and children’s pool, are spread across the garden dotted with olive trees. The white-sand private beach stretch to 450 metres and promise loads of fun in the sun. The hotel also runs a luxurious spa that facilitates a diverse range of treatments and wellness programmes, complemented by a fitness studio. There’s an extensive list of sports and games to choose from a list that includes floodlit tennis courts and several other water sports. The evening at Ikos Olivia is lightened up with live music shows and night parties. There is a mini market, jewellery and clothes shop in case you are smitten by the shopping bug. The hotel also arranges for weddings and helps you make cherishing memories for life. 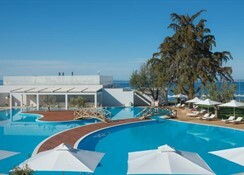 Hotel Ikos Olivia is an hour drive from the Thessaloniki International Airport (70 km). Petralona Cave (38 km) and Ancient Olinthos (10 km) are some of the popular tourist attractions near the hotel. Within easy reach of tourist information, city centre, bus stops and bars and restaurants, the hotel is well accessible from all major tourist destinations in the neighbourhood. Featuring 149 private bungalows and 142 bedrooms and junior suites, Ikos Olivia offers a wonderful range of accommodations that come with private balconies, terrace, gardens and pools. With floor to ceiling windows, all the rooms guarantee picturesque garden or sea views. Each of the stay options is laced with en-suite bathrooms equipped with rain shower. 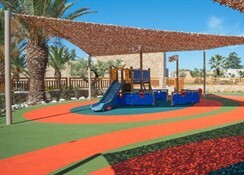 Among the other facilities are flat screen satellite TV, DVD player, coffee machine, mini bar, bathtubs and sun loungers. There are 4 a la carte restaurants serving cuisines from around the world. These include Ouzo (Greek), Fresco (Italian), Anaya (Asian) and Provence (Provencal). The buffet restaurants serve Mediterranean dishes while in-room breakfast service ensures cosy mornings. the hotel also encourages guests to try authentic Greek food and wine at no extra cost. The 6 indoor and outdoor bars cater to the drinking choices of the guests at Ikos Olivia. 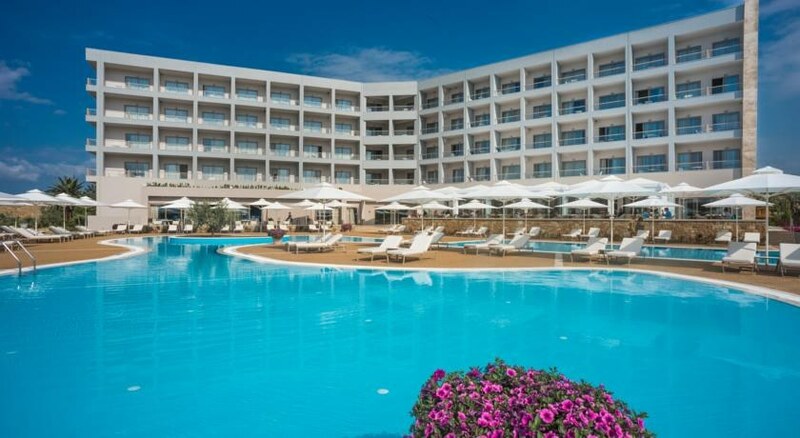 There are a number of swimming pools at the hotel, including a lagoon pool with swim-up bar, a heated pool, children’s and baby paddling pools. The 450m-long private white sandy beach is the perfect place to lounge in the sun. 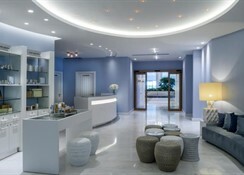 Ikos Olivia also has a wellness centre equipped with an indoor heated pool, sauna, massage room and steam bath. 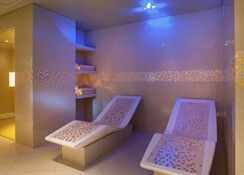 The spa is run by Anne Semonin – the renowned French beauty brand. For sports lovers, there are 2 floodlit tennis courts and facilities for table tennis, basketball, beach volleyball, mini football, aerobics, yoga and Zumba. 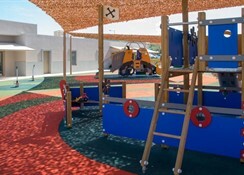 Children can have limitless fun at the kids’ club that organises games and activities. Adventure lovers can opt for scuba, snorkelling, water polo, canoeing, paddling and mountain biking. The fitness studio helps the guests maintain their fitness routine, supported by personal trainers. 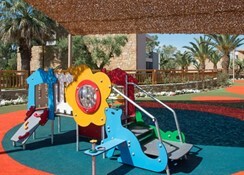 The hotel’s entertainment options include everything from live music and musicals to children’s shows and movies.